It’s been more than four years since ex-Chicago police Officer Jason Van Dyke’s fatal encounter with 17-year-old Laquan McDonald in the middle of South Pulaski Road. After years of legal proceedings and a murder conviction in a monthlong jury trial, the former officer has now learned what his punishment will be. Cook County Judge Vincent Gaughan on Friday sentenced Van Dyke to 81 months in prison – just under seven years. The decision brings to a close a criminal case that began more than three years ago when Van Dyke was first charged, hours after the city released bombshell dashcam footage of the shooting. Van Dyke was convicted by a jury in October on charges of second-degree murder and 16 counts of aggravated battery with a firearm. He was also acquitted of official misconduct. Gaughan chose to sentence only on the second-degree murder charge, ruling that to be the more serious offense despite the fact that aggravated battery with a firearm is a Class X felony with a lengthier prison range. Had he been sentenced on those charges, Van Dyke could have served consecutive six-year sentences on any or all of the 16 aggravated battery counts he was convicted on. State law requires at least 85 percent of Class X sentences to be served. But instead, under the second-degree murder charge, which is a Class 1 felony, Van Dyke will likely only have to serve about half of his term length. Lead defense attorney Dan Herbert spoke with his client after the sentence was announced, and said it was the first time throughout the lengthy case that Van Dyke "truly felt great." "We're happy with the sentence," Herbert said afterwards. Video: Reaction to the sentence of Jason Van Dyke, plus testimony from the courtroom. Despite the fact that Van Dyke's sentence is significantly shorter than the 18-year minimum the state recommended, special prosecutor Joseph McMahon said Gaughan's decision "respects the jury's verdict." "It strikes a balance between holding Jason Van Dyke accountable, but also recognizing his service as a police officer as well as the fact that otherwise he has no criminal record," he said. McMahon spoke with McDonald's mother, Tina Hunter, after the sentence. He wouldn't discuss specifics with media, but recognized the term was "not everything the McDonald and the Hunter family wanted." "It is still as difficult today as I think it was for her over four years ago when her son was murdered," McMahon said. The sentencing decision comes just a day after three other current and former Chicago police officers were acquitted on conspiracy, official misconduct and obstruction charges after they were accused of working to shield Van Dyke from a criminal prosecution after the shooting. Van Dyke's attorneys called several witnesses on Friday, including former Fraternal Order of Police President Dean Angelo and Van Dyke's own daughter, Kaylee, who said she felt like her heart was "ripped out of her chest" the day her dad was convicted. Van Dyke's wife Tiffany said she prays for McDonald's family every day, calling the shooting a tragedy, but adding that her husband should be punished for doing "what he was trained to do." 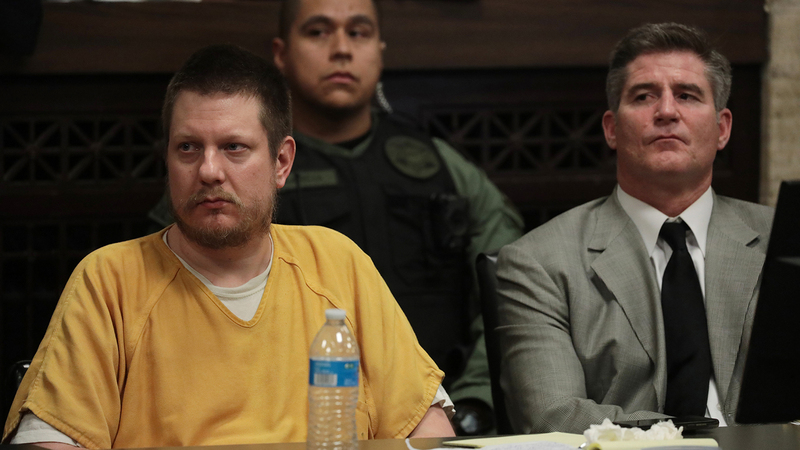 The state called witnesses of their own in aggravation, hoping to give the judge a better view of Van Dyke’s conduct as an officer throughout his years on the force before the shooting. Those included four black men who gave emotional testimony about various abuse they claimed Van Dyke inflicted during separate incidents. The first, Vidale Joy, testified Van Dyke had put his gun to his head and used a racial slur during an encounter in 2005. Officers had approached Joy as he was leaving a gas station in his vehicle, but he said Van Dyke was the only one who drew his weapon. The defense impeached that testimony, pointing to a complaint Joy filed shortly after the incident in which he mentioned neither the slur nor the gun being placed to his head. Edward Nance said Van Dyke pulled him from his vehicle during a traffic stop in 2007 and slammed him on his back against the rear of his car. He was then handcuffed behind his back and pushed face down in the backseat of Van Dyke’s squad vehicle. He testified he eventually needed surgery on both shoulders due to rotator cuff injuries caused in the encounter and ended up suffering from anxiety, depression and PTSD. A defense attorney disputed that the encounter caused those issues. Eric Breathett, 28, said he was denied his inhaler by Van Dyke after he was handcuffed during a 2009 traffic stop in which he was having an asthmatic incident. When asked to identify Van Dyke in court, Breathett looked over to the defendant, chucked and said, “He’s definitely wearing the right attire,” in reference to the yellow jail jumpsuit Van Dyke was wearing. Another man, Jeremy Mayers, testified Van Dyke had choked him briefly during a DUI stop in 2011. The events of Oct. 20, 2014 began with a 911 call placed by truck driver Rudy Barillas, who found McDonald inside a private truck lot near South Pulaski Road and believed he was in the process of stealing radios. After the call, McDonald – who was high on PCP – lunged at Barillas with a knife and fled the scene. Barillas was uninjured in the attack and can be seen on dashcam video pointing the approaching officers in McDonald’s direction as they pull up to the lot. Police learned at 9:53 p.m. that McDonald was armed with a knife. Three minutes later he used that knife to pop a tire and stab at the windshield of a pursuing squad vehicle before running onto Pulaski. Van Dyke and his partner Joseph Walsh arrived on the scene moments later, driving past McDonald on Pulaski Road as the teen walked, knife in hand, down the center of the road. Van Dyke testified he attempted to open his door to try and knock McDonald to the ground, but after pulling past him, he and Walsh came to a stop and exited their vehicle at about 9:57 p.m. Within six seconds of doing so, Van Dyke moved in and began shooting McDonald, who spun and fell to the pavement. After the teen fell, prosecutors say Van Dyke continued firing for 12.6 seconds. In all, the officer fired 16 shots. The trial proceedings earned widespread national attention, marking the first time a Chicago police officer had been charged with murder stemming from an on-duty shooting in decades. In a surprise move, Van Dyke took the witness stand in his own defense during the trial, testifying that McDonald’s eyes were “bugging out of his head” and claiming he only fired his weapon after the teen waved his knife toward him. But earlier that day it was revealed Van Dyke had told his partner “we’re going to have to shoot the guy” as they drove to McDonald’s location. The 12-person jury deliberated for nearly seven hours over the course of two days before returning with a verdict. Rather than convicting on first-degree murder, they opted for a lesser charge of second-degree murder. Speaking after the trial, multiple jurors criticized Van Dyke’s testimony, saying it felt rehearsed and untruthful. Following his conviction, Van Dyke was immediately taken into custody and entered into the Cook County Jail. He remained there for just four days before being transferred to the Rock Island County Jail in a move made “in the best interest of his safety as well as the safety and stability of the jail compound,” according to local officials. Van Dyke has remained there since, spending the vast majority of his time isolated from fellow inmates in order to ensure his safety. Despite past promises of appeal, Van Dyke's attorneys on Friday were no longer ready to discuss their future plans in this case.